Ireland is an island approx. 300 miles (482 Km) long and 150 miles (241 Km) wide. The Shannon Region – the Mid-West of Ireland is approx. 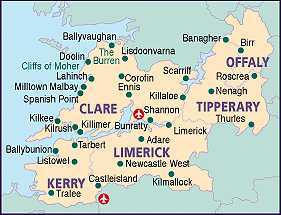 100 miles (161Km) from end to end and comprises all of counties Clare and Limerick as well as South Offaly, North Kerry and North Tipperary. Limerick City is the Capital of the region; besides Bunratty, regional towns include Ennis, Co. Clare; Tralee, Co. Kerry; Nenagh, Co. Tipperary; and Birr, Co. Offaly. Discover Ireland provides a list of attractions. Also try Shannon Airport.ie for more information about the region; they provide some interesting videos. Also try Holiday Ireland for more information about the region. They have an excellent map navigator. DiscoverIreland.IE lets you search for things to do by keyword or county. See also the official website of the Irish Tourist Board. You can create a route and view a map of your travel itinerary! Also, try the online Limerick Post for interesting, current news. ShannonHeritage is another excellent online source of info.